The Model 6313 is an ox. Able to jack vehicle weights to 6,300 lbs. (1,574 lbs. 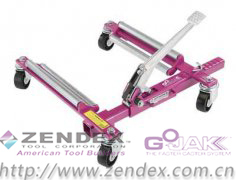 per wheel), including light duty trucks with tire widths up to 13 inches wide and 36 inches tall. 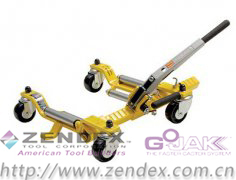 This auto jack / dolly is the most versatile and strongest GoJak® in the line. 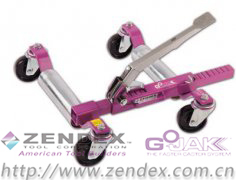 It has steel rollers, wider axles and two heavy-duty 5-inch diameter, and two heavy-duty 4-inch diameter, double-ball raceway casters. This combination makes for easier rolling with heavier loads. The Model 6313 has a 5-degree offset pedal for additional foot-to-tire clearance. The under frame clearance is increased an additional 2-1⁄2 inches over the 5211, which is very useful when pulling cars up flatbed trucks. Available in left and right hand units.